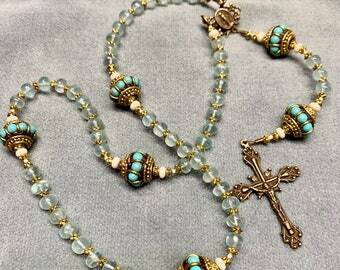 This Rosary features excellent quality, natural (green) Aquamarine Our Fathers flanked with gemmy Aquamarine rondelles. For the Hail Marys, green Goldstone provides a beautiful contrast. Goldstone, for those unfamiliar with the stone, is actually a type of glass created, some say by monks, in the 17th century as a sparkling coppery red stone. Today it’s available in several colors, including this gorgeous, forest green. The Crucifix and St Benedict center have been cast in solid Sterling from the antique originals, then burnished to the original patina. St Benedict is a strong defender against evil, an exorcist, and the founder of the Benedictine order. This is a cable Rosary, strung on strong, 49-strand, 40# test wt plastic coated stainless Steel. It is carefully double crimped for durability. This is a traditional, 6mm Rosary. 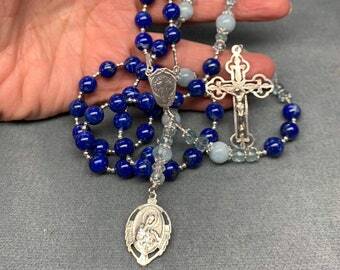 It is smooth and pleasant to use, and the larger, 3-bead Our Fathers make it clear you have finished the decade— helpful when you are saying your Rosary at night. As always, your Rosary will arrive boxed in silver and in a beaded gift bag—ready for presentation. LIFE IS TOUGH -- PRAY HARD! Beautiful! Just like I wanted! I know my recipient will love it! My rosary is absolutely beautiful, a handmade work of art, and a treasure to pass on. It’s all I was hoping it would be and more. Since I had extra requests for this purchase, I needed excellent customer service and I received it. I am so pleased with every aspect. I was accommodated like I was a longtime friend. She is a joy. I prefer Paypal, but money orders are accepted. If paying by money order, please convo me to let me know. In any case, payment should be initiated within 7 days unless otherwise arranged with me prior to purchase. Orders not paid, (or in the mail) within 7 days may be cancelled at my discretion. Full refund of purchase price if not delighted. Please notify me within 7 days of receipt. Please notify me if that timeframe needs to be adjusted (for example, Rosaries purchased for later gifting). Shipping is billed at actual cost for Priority/Priority or first class US and International mail. Many Rosaries are ready to send; others are handmade upon your order. This will be noted in the item description. 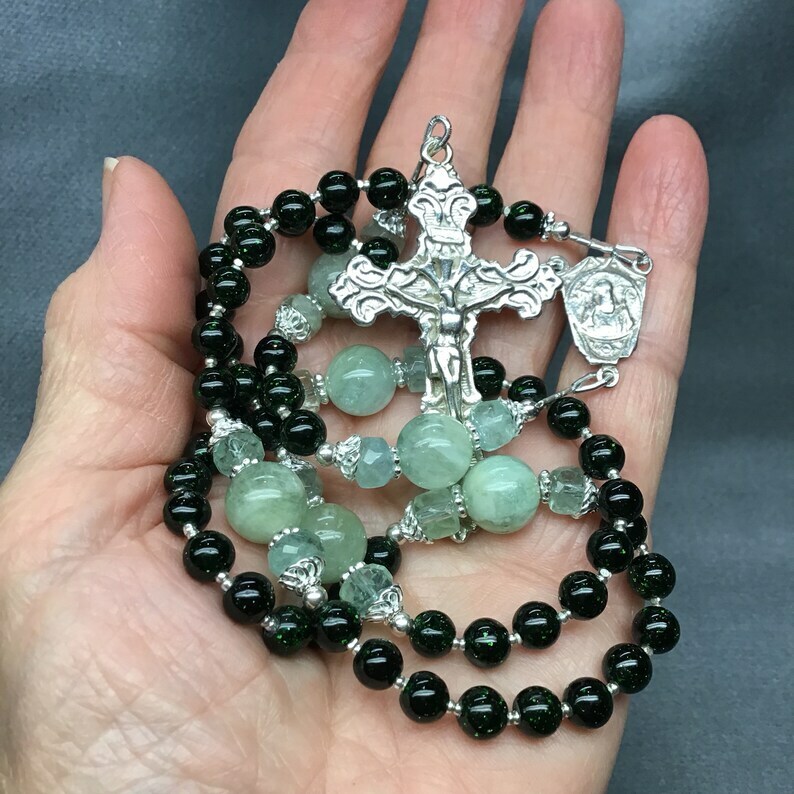 If made to your order, please allow up to 14 days to carefully handcraft your Rosary and get it in the mail. Need it sooner? Contact me— we will expedite your order if possible and notify you of new, earliest date within 24hrs. If we cannot meet your timeframe we will fully refund you. -Lifetime guarantee on breakage. Period. -We love coupons, but only one per order, please. Coupons are redeemable on regularly priced items only.